Virtually every day, Computer Troubleshooter’s engineers receive an enquiry from small business clients and residential customers asking for assistance with recovering data files. By the time they call, panic has set in as they fear that they have lost their valuable information. The client is often willing to do anything to recover the file and the valuable information contained in the file. In today’s environment clients are constantly storing data in digital format using a variety of devices. The risk of human error is ever increasing, and it is a known fact that over a quarter of data recovery requests are a result of human error. Customers are often relieved when they hear that accidently deleted files have the greatest chance of being successfully recovered. It is still a complicated process and often involves using data recovery software to achieve the recovery. 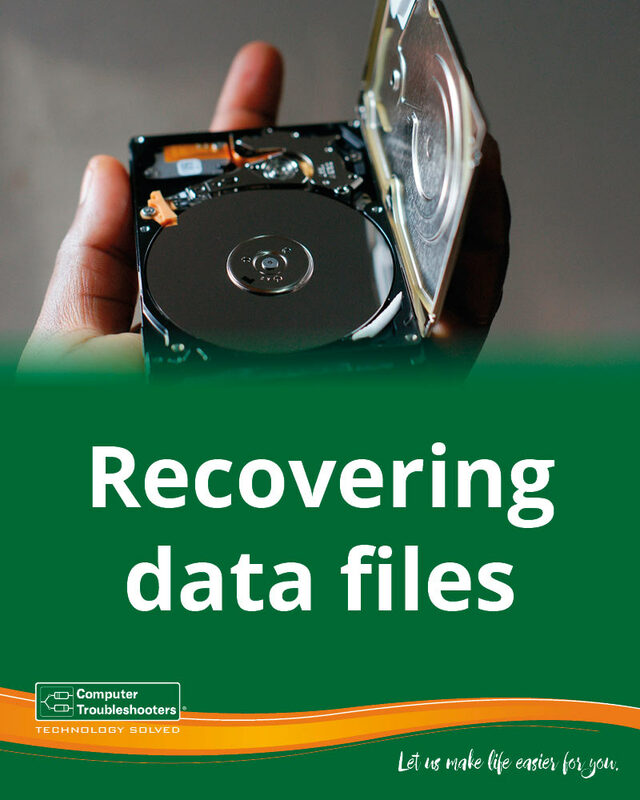 Data recovery software is required to examine the computers storage to find the remnants of the deleted data files and then extract them back into a recognisable form. Computer Troubleshooters recommend that if the information is valuable then you should have a data backup solution in place. This applies to residential clients as much as business clients. Key elements of this solution today are to include a cloud storage element enabling you to recover files quickly and efficiently. Computer Troubleshooters also recommend that the solution needs to include regular maintenance checks confirming that your data has indeed been backed up. Look at our affordable monthly subscription plans. What to do if you accidently delete a file? Deleted Items– if in email, check the deleted items folder (it is generally near your inbox) this holds all deleted emails until you close your email application. If you can see your deleted file in the deleted items folder just click & drag across back into your inbox. File restored. Recycle Bin– if the file deleted was a document or image file, check the recycle bin, which has an icon that is generally found on your desktop, click on the icon, it will show you deleted files that are awaiting permanent deletion (generally these are deleted when the computer powers off), just click and drag back onto your desktop. AutoSave–applications such as word and excel have an Autosave function that can sometimes save an automated version copy. Within the application click on the top left Office button which will show a menu that includes an item such as Word Options & Save Options, this will generally show the autosave settings and the file location of the autosave directory. You can then go to the indicated location and recover the deleted file (this may vary depending on which version of Office is installed). File Search– Use the Microsoft Search function located in the Start Button (on the bottom left) to try find your file as you may have saved into the wrong directory or you may find an older version. Restore Backup Files– if you have a backup in place you should be able to restore the file back on to your main computer hard drive. Of course, it will only be a version available from the last time you backed up. It will depend on where and what software you are using for your backup as to how this needs to be done. Software Retrieval – this will mean you need to consult a professional to use data recovery software to interrogate your drive, find, & restore your deleted files. Do not run any disk cleanup or defragmentation tools in the interim as these will overwrite drives which may contain your deleted files. Call your local Computer Troubleshooters for this professional service. No file found – of course we do find times when even we can’t retrieve an accidently deleted file, that’s when we call in our data recovery partners. Our data recovery partners have specialist equipment, software and use dedicated data recovery technicians to extract hidden data. After completing the above procedures you may have recovered your deleted files. Of course, being proactive about protecting your data is always the best protection. Back up regularly whether it’s for your business or your personal data. Denial is not a river in Egypt. Even with a tested and reliable backup system, sometimes unexpected accidents can still happen. 74% of data recovery involves physical damage or corruption which can happen to all data storage devices including hard drives, cell phones and memory sticks. Hard Drive Recovery:Hard drives are becoming increasingly less common in laptops. External storage devices are in greater use but are at greater risk for being dropped, damaged and compromising your data. SmartPhone and Flash Drives:Flash drives are no moving drives problems such as deleted files, corrupted partitions, file system damage and physically damaged devices can be remedied by their recovery experts. Notebooks, Tablets, Digital Cameras and MP3 Players: recovery services for Notebook PCs and Tablets. Damaged image or audio files can also be recovered. If you have accidently deleted files; don’t panic, if approached logically the deleted files can generally be retrieved. If you need for help recovering a deleted file, or more serious data recovery services, or assistance in establishing solution call Computer Troubleshooters and one of our technology professionals can help you.